I wish I could gush more about Steven Pinker's book The Better Angels of our Nature. (Here's Peter Singer's extremely enthusiastic review.) The book has a provocative thesis--that violence has declined over the course of human history. It offers a rich variety of explanations, many with implications for how we can reduce violence even more. Its sentences (all 50 billion of them) are beautifully written. So what's to complain about? Answer (for me): this book is too (er) syllabular. What? There are two ways to write a book (besides all the other ways!). A book can be thesis-driven, with every chapter, section, paragraph, and sentence playing some role in advancing the thesis. And then a book can simply cover a topic, with the outline being much like the syllabus for a course. Academics are in the habit of creating syllabi, so it's very natural for them to write books that are ... syllabular. Better Angels is about 50% thesis-driven, and 50% syllabular. In just one of Pinker's hundred-page chapters (ouch), there are dozens of pages that are (it seems to me) pedagogically motivated. I'm not against learning (! ), but prefer thesis-driven writing. The perfect example: Jared Diamond's book Guns, Germs, and Steel. Diamond does not set hmself up as "the professor" educating his reader on all things "geography", but as answering a question (and a great question too). The reader is thus carried along by a desire to find out the answer, whereas (for me anyway), Angels doesn't have that sort of momentum. You keep going because the course isn't over yet, not because the thesis is still being developed or hasn't been fully supported. At times no thesis is directly in view--we're just being very exhaustively taught the subject of violence through the ages and its causes. On to substance. Having spent so much time with Pinker in the last two months (I'm a slow reader), I have a pretty good feel for what's on his mind (I think). Pinker doesn't like political correctness and fashionable nonsense. One thing he doesn't like is the tendency of liberals to think the sky is falling--"Everything's getting so much worse, what is the world coming to?" Not only is this an annoyingly fashionable view of the world, it's flat out false. So he argues, drawing on vast amounts of history, data, etc. I found this part of the book mostly persuasive, but perhaps sooner than I was meant to. A more skeptical reader might be more engrossed by all the evidence and take more pleasure in being slowly won over to Pinker's view. Then there are all Pinker's explanations. This would have been a more exciting book if he had been able to point to 2-3 causes of the decline of violence, but he points to dozens. The development of Enlightenment ideas about human rights and equality. The spread of literacy, so people became better at entering the point of view of others. Hygiene, believe it or nor. Disgustingly smelly people with bad breath are not as hard to torture and kill. Confidence about the future, so that there's something worth avoiding violence for. The "expanding circle," in Peter Singer's sense, so more and more people (and even animals) started to count. A shift away from moralities centering on honor, community, the sacred, and incommensurable values--this stuff generates violence; a shift toward moralities centering on harm and fairness. And a lot of other stuff. This is the kitchen sink theory about declining violence--sadly the truth is not always satisfyingly simple. I have just a few substantive objections. One concerns the decline of violence toward animals--just one of the many trajectories Pinker traces. I think Pinker massages the data a bit, to make it tell a "getting better all the time" story. And it could be that he does the same thing elsewhere in the book--I'd love to see responses to his history-telling and criminology from experts on the many topics he covers. So--things seem horrendous for animals now, right? There's factory farming on a massive scale, and millions of animals are also used in medical research. How is it that things are getting better? Pinker makes his case partly by showing they used to be worse than we thought. There are some fascinating passages here about tenderization of meat in the 17th century. It turns out they tenderized live animals by whipping them with knotted ropes. Nice. Amazingly enough, confinement farming was known to these people as well. The Elizabethans fattened pigs by confining them to small spaces and birds were fattened by being nailed to the floor or having their legs cut off. Considering where we were centuries ago, it's no longer obvious that things have gotten worse. Yet its important to know how often animals were treated in these horrifying ways in the 17th century. If these were just the excesses of the rich, the scope of modern violence toward animals is much more vast. Not only are there way more of us, so more animals are suffering, but per capita meat consumption has risen. 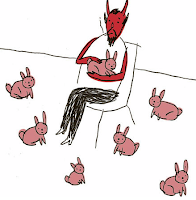 Each human is no more savage, and probably less savage, but the total amount of "bad" is much greater. This matters, surely (more on that below). What does it mean to say "live animals are now protected from being hurt, stressed, or killed in the conduct of science"? I would think it means they are no longer being hurt, stressed, or killed in the conduct of science. But that's obviously untrue. 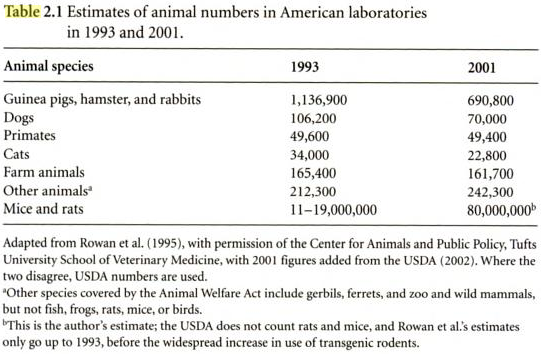 Here are some estimates of the number of animals used in animal labs from lab vet Larry Carbone's excellent book What Animals Want - and of course they're all stressed, most are killed, many are hurt. Perhaps what Pinker meant by "protected from" is that someone's minding the lab. There are regulations that cover exactly how much animals are stressed and hurt and how many are killed. Yes there are, and that's evidence for a decline of violence. But Pinker exaggerates how much protection the regulations afford animals. He says the Institutional Animal Care and Use Committees (IACUCs) that review research protocols do things like regulating "the size of cages, the amount and quality of food and veterinary care, and the opportunities for exercise and social contact..." (p. 456) Yes, all that's spelled out in the Animal Welfare Act. But then he says "Any experiment that would subject an animal to discomfort or distress is placed in a category governed by special regulations and must be justified by its likelihood of providing 'a greater benefit to science and human welfare.'" Unfortunately, there's no reference associated with the quote within the quote. That passage is not part of the Animal Welfare Act. I can only guess that he may have been thinking of the "The Sundowner Principles" a standard that does involve cost-benefit balancing. This is a standard that's not part of the AWA mandate; the committees do not have to think in these terms. Of course, if they do anyway, it's fair for Pinker to say so. But they don't. At least, this is what Larry Carbone argues in his book, based on nearly 20 years of serving on these committees, and based on research on how they operate. Carbone is emphatic that IACUCs are not ethics committees, precisely. They take it for granted that most research will be authorized, whatever the balance between costs to animals and benefit to humans. Animals can be "asked" to suffer a lot, for the sake of relatively trivial gains to people, like the gains involved in developing new cosmetic procedures. The committees merely make sure that research that's done--possibly with a troubling cost-benefit balance--is done using no more animals than necessary, and no more stress and suffering than necessary. The committees do important work on behalf of animals, but they don't entertain the possibility that some research is unacceptable no matter how it's done, because the gains to humans aren't worth the losses endured by animals. Gains to humans are always (or at least almost always) worth pursuing, though the idea is that we should select less painful routes to these gains, other things being equal. I think Pinker is right that today open cruelty to animals is not tolerated. There are expectations that we will not be wantonly cruel or blood thirsty, and labs are supposed to be clean places with at least minimally decent shelter, food, and veterinary care. Blatant violence and negligence are no longer tolerated. For all that we have more humane intentions, though, and we're required by law to have humane intentions, there are now more suffering animals in the world than ever before, and not just because there are more of us. There are also more animals per capita--more are being used to support the diet, health, clothing, etc., of each individual human being. A puzzling issue about the book has to do with the way Pinker assesses amounts of violence. We are not to think violence has increased just because of the huge death toll of 20th century conflicts. Numbers have to be seen relative to the size of the world's population. ... while the 20th century certainly had more violent deaths than earlier ones, it also have more people. The population of the world in 1950 was 2.5 billion, which is about two and a half times the population in 1800, four and a half times that in 1600, seven times that in 1300, and fifteen times that of 1 CE. So the death count of a war in 1600, for instance, would have to be multiplied by 4.5 for us to compare its destructiveness to those in the middle of the 20th century. Suppose, as Pinker observes, Cain wiped out 25% of the world's population when he killed Abel. There were just Adam, Eve, Cain, and Abel, when he committed fratricide. Now suppose that today history (sort of) repeats itself, and 25% of the world's population suddenly gets wiped out by fratricidal lunatics. That's 1.75 billion people. Is it the same? Well, in a way it is. Human nature hasn't gotten any more fratricidal since Cain's time, if 25% of people are wiped out on both occasions. And the risk to any person of being a fratricide victim is the same. From a moral perspective, though, all is not the same. The 2011 Great Fratricide generates a vastly larger quantity of bad. If God is a utilitarian, and wants to intervene just once, he'll prevent the Great Fratricide. Likewise, those who let the Great Fratricide transpire have more to answer for than those who let Cain's fratricide transpire. We who are now too passive in the face of huge slaughters are morally worse than people in earlier times who watched the same percentage of humanity be wiped out. If the total amount of "bad" is greater, there is more reason to stop a slaughter, and more reason to condemn those who fail to do so. So we can agree with Pinker that violence is not increasing, but also think there's a basis for growing concern. The bloodbaths we're failing to prevent involving larger and larger total amounts of death and suffering. It shouldn't soothe the conscience that deaths are not increasing, relative to the total human population. So much for some scattered thoughts. If you've read the book, tell me what you think. About the percentages versus raw number... If we're generalizing about the amount of violence/suffering in the world, it seems to make sense to talk about percentage based numbers, than individual actions. Had I lived in the 12th century, I no doubtedly would have probably been culturally reared and accepted, even doled out more violence than I would today on average. No doubt volume of wrong matters, but from what I gather, Pinker isn't making a moral argument here, he's trying to assess the common place-ness of violence (Right? I haven't read it). It seems that you are saying Pinker strays from a utilitarian perspective to make some of his points. If so why such glowing reviews from Singer? Well... I think Wayne is right that Pinker is measuring amount of violence, not amount of badness. Singer presumably recognizes that, so doesn't care about the departure from utilitarianism. Just one more argument for relativism: everything is negotiable! Yes but that's a caricature of course. There is no necessary connection between relativism in general and the acceptance of any particular behavior. Even if it IS right for THEM, it's not necessarily right for US not to do anything about it. Analogy: it's totally "right" and "natural" for the squirrels in my attic to move in and make themselves at home. That doesn't mean I'm going to let them do it. If necessary, I'm going to kill them because they are eating my wires. As it happens, it's not necessary to kill animals to remove them from your attic...but it some cases...well. It does come to elimination. It depends on the form of relativism. Some forms (but not all) say rightness is relative to local standards, so beheading alleged witches really is right for the Saudis if the local mores approve. So Americans ought to recognize the rightness. It gets tricky if our local mores saw we should interfere with activities elsewhere that are locally right. That part of our own local morality reflects our metaethical stupidity, I would think. A relativist (of the type I am imagining) would want us to change our ways. In fact, I think a lot of relativists (like in anthropology) expressly want relativism to be a restraint on intervention--that's part of its point. Well I think it's tricky...all the way down, in both your relativity scenarios. I definitely agree that standard anthropological relativism says "hands off!" But that's because the local morality of western liberal anthropology has a prior commitment to preserving unique species of culture. Moral absolutists may not excel at restraining themselves from violence, but they excel at preventing it: A Saudi woman was beheaded for witchcraft just a few days ago "Time to get your guns!" -Your Neighborhood Moral Absolutist. Silly? yes. But you have to show how the moral absolutist prevents violence by virtue of their grasp of moral reality in a way that doesn't involve...more violence. Faust did a fine job of defending (a certain form of) moral relativism so I'll leave that alone. However, there is one thing that Pinker appears to miss, while x% of the population being harmed/killed may appear the same in 1600 as 1900 it fails to take into account the future life that those people would have. If life expectancy increased from 40 to 80 over those years there is a lot of positive future happiness to discount when making the comparison. Obviously no-one has any idea how to compare suffering to happiness let alone discount it over the years, but both the expected quality of life and the expected length of it must count when we talk about the harm caused by ending it. I haven't gotten all the way through this post yet but I did want to offer a few notes on cruelty to animals. First of all, the NIH (IIRC?) recently declared that funding for most kinds of chimp research will be suspended while they review the scientific merits of the research currently being done. This seems to me like an example of the sort of progress Pinker is talking about. I also wanted to point out some facts about dog fighting. Just read the history section of wikipedia's article on dog fighting in the U.S. We have a "past-time" that was quite popular through the 19th century and still legal even until the 1970's in some states. I think the media's treatment of Michael Vick, though perhaps deserved, shows how far people have come in their attitude towards animal bloodsports. I know these are just two more random examples but I think they're more telling than examples of factory farms in a number of ways. Most saliently, factory farms are the way they are for economic reasons, not because of human cruelty. To the extent that the health and safety of the animals in such farms are disregarded this is due to callousness rather than outright cruelty. Some farms have hired Temple Grandin to help make the process more humane and all of them do what they can to prevent the ultimate customers from having to confront the details of how, in the famous phrase, sausage is made. Also consider the fact that in the world before factory farms people who wanted to eat meat would have to slaughter and butcher the animal with their own hands (and doing so would not be considered the least bit unusual or cruel by most). Compare to a world of factory farms in which I think the vast majority of meat-eating Americans would be a little queasy at the prospect of killing and butchering their own meals. Perhaps factory farms might -- rather perversely -- actually be a sign of the diminution of human cruelty (the cruelty is still there but the humans have been taken out of the loop).